This Hawk has been at our practices many times over the years. 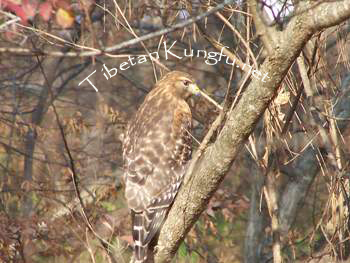 The park that we practice at is a mile from the school and so this Hawk has been present at both places many times. In fact, several students have had encounters that were closer than comfortable. On two occassions, during posting this Hawk has swooped down within a few feet of myself and others. Once close enough to hear the wind moving in its wings. One of our students is camera ready most of the time, and luckily for us he was able to capture a picture of our feathered friend. The Hawk had swooped down once, Reid got his camera, and the next time the Hawk swooped, landed Reid got this terrific shot.